The current population of Côte d'Ivoire is 23,449,538 as of Saturday, November 12, 2016, based on the latest United Nations estimates. Côte d'Ivoire population is equivalent to 0.31% of the total world population. Côte d'Ivoire ranks number 56 in the list of countries (and dependencies) by population. The population density in Côte d'Ivoire is 73 per Km2 (189 people per mi2). Côte d'Ivoire is bordered on the north by Mali and Burkina Faso, on the west by Liberia and Guinea, on the east by Ghana and on the south by the Atlantic Ocean. 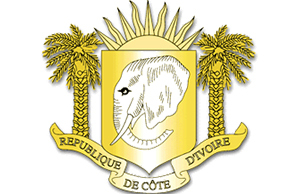 Côte d'Ivoire has both a tropical climate in the south and along the coast (including Abidjan) as well as a semi-arid climate in the north. The temperatures range from 26 - 40 degrees Celsius or 79 - 104 degrees Fahrenheit. The humidity level stays fairly consistent varying between 80 and 90%. ​Duing the long rainy seasons, it is possible for it to rain continuously for many consecutive days and very intensely for hours at a time. It is also common for roads to flood in low lying areas. Côte d'ivoire is among the world's largest producers and exporters of coffee, cocoa beans, and palm oil. Consequently, the economy is highly sensitive to fluctuations in international prices for these products and to weather conditions. Despite attempts by the government to diversify the economy, it is still largely dependent on agriculture and related activities. During the last few years Côte d’Ivoire has benefited from strong economic growth, with GDP having remained steady at above 8%, supported by strong export in cocoa and palm oil. Since the discovery of oil reserves in 2012 the export of oil and gas has largely supported economic growth. The relatively peaceful elections held in October 2015 secured a second term for President Ouattara, who has focused on rebuilding the country’s infrastructure and establishing economic and political stability. Cocoa, coffee, tropical timbers, petroleum, cotton, bananas, pineapples, palm oil, cotton, and fish. Food, manufactured consumer goods, heavy machinery, fuel, and transport equipment. With a population of 4.7 million, Abidjan is the second largest city in the West African region, following Lagos, the former capital of Nigeria. Considered a cultural hub of West Africa, Abidjan lies on the south-east coast of the country in the Gulf of Guinea, on the Ébrié Lagoon. There are 11 main neighborhoods that make up the city. You can find more information on these different neighborhoods at our link here! The Basilica of Our Lady of Peace of Yamoussoukro surpasses even St Peter's Basilica, with an exterior area of 30,000 square metres. Finished in 1990, its design is said to have been inspired by its Vatican City sibling, with a hefty dose of Renaissance and Baroque style. It can hold about 18,000 worshipers, though is very rarely full. Didier Drogba, of course. Perhaps best remembered for his domineering time at Chelsea, the striker was born in Abidjan and represented his country 104 times, scoring 65 goals. He captained the national team for eight years from 2006 and retired as the nation's all-time top goalscorer. Today he plies his trade in the US for Phoenix Rising. Naturally. Les Éléphants won the 1992 African Cup of Nations and again in 2015, both by beating Ghana on penalties. Yaya Toure, Wilfried Bony and Salomon Kalou have also represented the team. The only Olympic gold ever won by the Ivory Coast was in Taekwondo at Rio 2016 by Cheick Sallah Cisse. A second in the sport - bronze in the same Games - and a silver at the LA Games in 1984 in the Men's 400 Metres complete its modest tally. Popular with holidaymakers for its golden beaches, fading French colonial heritage and traditional Senufo cultural experiences, Côte d'Ivoire has seen its annual visitor numbers rise steadily in recent years - 250,000 in 2010 up to 1.44m in 2015. Mount Nimba rises above the surrounding savannah where Côte d'Ivoire meets Guinea and Liberia. A Unesco World Heritage Site, the mountain is covered by dense forest harbouring a rich variety of flora and fauna, including chimpanzees. The country boasts three more Unesco World Heritage Sites in the shape of the historic town of Grand-Bassam, once a colonial trading post, Comoe National Park, one of the largest protected areas in West Africa, and Tai National Park, home to 11 species of monkeys. In 2013 it shifted 1.448million metric tonnes of cocoa beans (31.6 per cent of the world's total), nearly double its nearest rival, Ghana. Yamoussoukro is the nation's political capital while Abidjan is its economic capital and the largest city. Abidjan is the city with the third biggest French speaking population anywhere in the world. It is also the fourth most populous city in Africa, with about 4.7million people living there. This is St Paul's Cathedral in Abidjan, built at a cost of $12million.